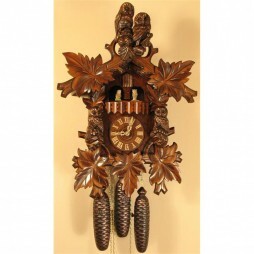 Accentuate the classic look of your home décor with this innovative Pheasant and Rabbit Cuckoo Clock with 8 Day Movement. Traditional carved scene depicts the day of the hunt. 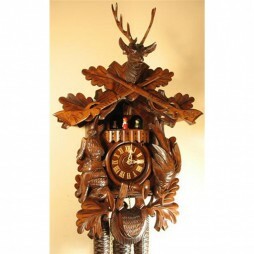 A majestic deer head stands above with guns hanging below, carved with intricate detail. Made in Germany, this clock features large, Swiss-made, 36-note music box movement and Shut-off switch. 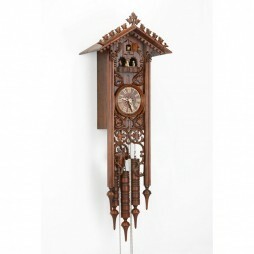 Fabricated by leading German watch-makers, Romach und Haas, the After the Hunt Cuckoo Clock is a very pretty wall clock. It is carved in such a way that it captures the after the hunt scenes very smartly. The clock has a brilliant musical mechanism and it produces the sound of birds with real wooden whistles. Furthermore, it has cute birds and animated dancers that pop out at every cuckoo call. 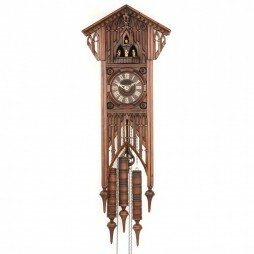 This large decorative clock is exemplary model that depicts the old world charm in the most unique way. 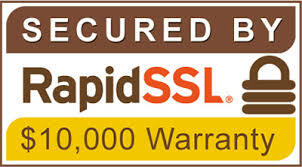 It comes with a 2-year warranty. Spruce up the vibe of your home by bringing in this classic clock! How about adorning your walls with a classy miniature of a German Black Forest chalet? Yes, this can be reality with the ever-stylish Cuckoo Clock with Clock peddler, which runs for 8 days on one wind. It is a bright and beautiful clock that features clock peddler figures carved with precision and hand painted with the most vibrant shades. The roof of this chalet roof comes laden with shingles that goes well with its timber facade. Also, a small footbridge it placed at the foot of the chalet. The beautiful windows add more grace to the complete model of this clock. Get this quirky teller of time at an affordable price today! 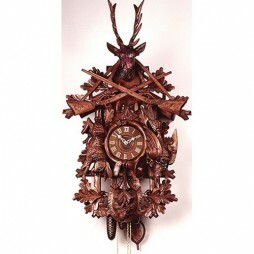 For the ones who enjoy hunting in the wood, this is a charming wall clock to own. 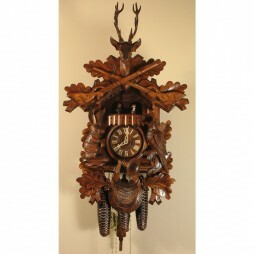 With its 8 day movement, the Grand Hunt Cuckoo Clock captures the daring hunting scene with absolute brilliance. It has a mindfully designed pendulum that adds more highlights to its look. 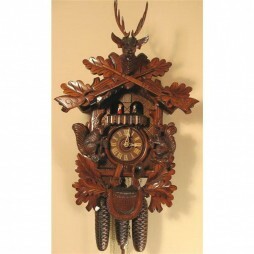 The clock features a hand carved deer head, oak leaves, hunting horns, bird, rabbit and guns strategically placed in the frame. Crafted in German, the clock has bold golden hands that point at the Roman numerals. They glide smoothly telling the daring tale of time. 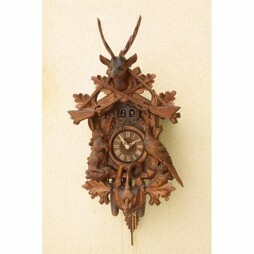 It is a traditional piece of timekeeping art that you’ll simply love bringing home. 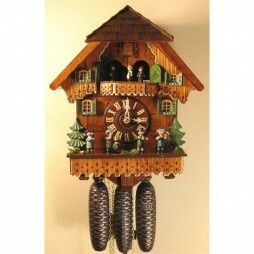 Black Forest Germany cuckoo clocks are some of the most immaculately crafted in the world today. The long, enduring history surrounding the emergence of these beautiful clocks is remarkable as well. Through the years there have been numerous craftsman who have added to these and enhanced upon them. 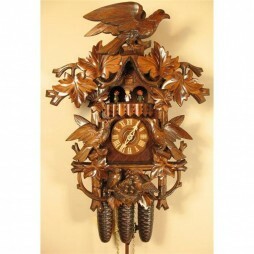 Now, these 8-Day Musical Cuckoo Clocks are some of the more popular time pieces too, and they have been since their birth. Not only do they carry heavy detail, many of them are made to play an amazing musical tune on the hour and quarter hour. 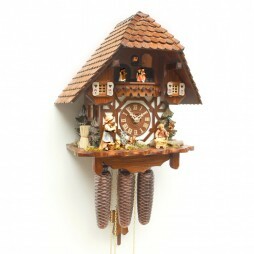 From the fascinating carvings, to the multiple ornamental figurines, on to the exceptional mechanics—Black Forest German 8-Day Musical Cuckoo Clocks are superior to many others on the market today. The mechanical workings are also essential to their quality and function—an aspect that will be discussed here. 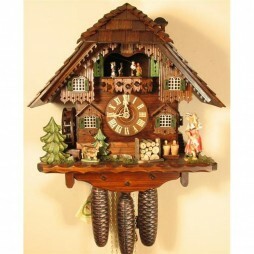 Cuckoo clocks that do originate from the Black Forest area are some of the most durable, brilliantly carved pieces from around the world. 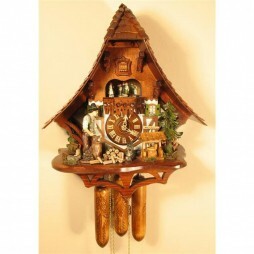 They can be easily identified from other cuckoo clocks too, due to their vibrant hues and the original creativity that is involved in the crafting of them. Not only are these two previous statements very true—but the mechanical workings inside the clocks are very important as well. 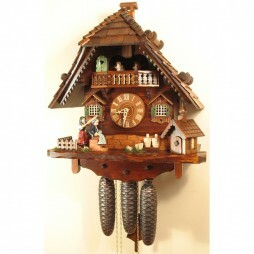 For example, let’s consider the sound traditional Black Forest cuckoo clocks make. This happens when a matching pair of bellows are pumped when the cuckoo comes out. Depending upon the size of these, and the materials used to create them, they can produce quite a varying sound—but one that is distinct too. Those purchasing these clocks also need to consider the style of the clock too. Each style is unique. 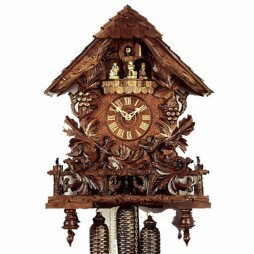 Some 8-Day musical cuckoo clocks have bigger bellows, while others have smaller ones. This affects the sound quality too. Some make a deeper call, while others have the high pitched, more common call. Actions and/or mechanics of the Black Forest German cuckoo clock are also varying. 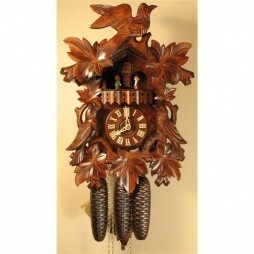 You might find some cuckoo clocks have faster cuckoo bird movement. The bottom line here is that when it comes the artistry of these and the hand carving qualities you’re going to get an infinite amount of differences. This is one of the very reasons so many people love these pieces. When speaking about style, design, age and mechanics, quality and worth of these masterpieces does come up. Let’s take a look at this specific area. 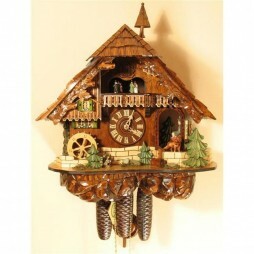 8-Day Musical Cuckoo Clocks also feature a variety of sizes and quality music boxes. The larger clocks feature Swiss music boxes, with deep, crisp sound. 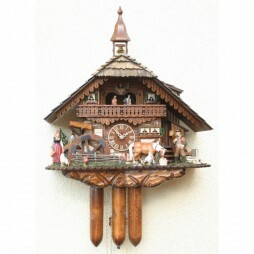 How Do You Really Know the Worth of Your Black Forest German Cuckoo Clock? If you’re not aware of what the common characteristics of these cuckoo clocks are, let’s point that out first. We’ve mentioned the hand carving, but surely collectors and purchasers want to know what really is looked at when determining value. From the natural qualities of the wood chosen to the style of engrained leaves and animals—these characteristics not only add depth but they add to the worth. 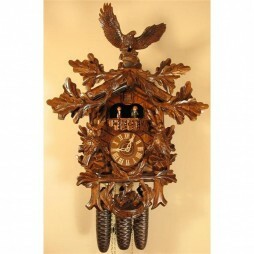 Many hand carved Black Forest cuckoo clocks in Germany are always hand carved and commonly have horns, rifles and other embellishments that allow them to stand out from the crowd. This also helps in defining them as authentic time pieces as well. 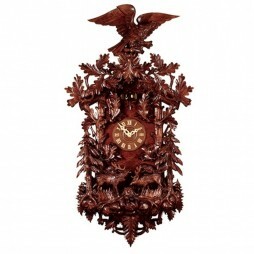 If a collector purchases a cuckoo clock that is rare in style and design, or which is extremely old then they do have an exceptional piece in their hands. It can actually be worth quite a lot. However, a buyer would want to have their clock evaluated by an antique dealer too. Still, the newer clocks are normally worth far more. The reason is simple. 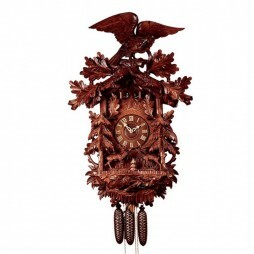 As technology advances and improves, so too does the creation and development of the traditional Black Forest German cuckoo clock. Though these are undeniable facts, most passionate collectors find the real value and worth lies in passing these down from generation to generation. And just don’t forget: the mechanical movement has an impact on worth too! 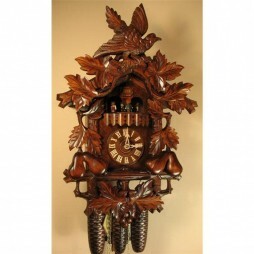 The Mechanical Workings of the Cuckoo Clock Are Significant to the Value Too! Yes, definitely a newer cuckoo clock is going to have more precise mechanisms and movement than that of an older model. One thing you’ll notice about movements is the pendulum is constantly moving, whether this is an 8-day cuckoo clock or a 1-day cuckoo clock. You can consider the movement of your cuckoo clock to be the actual heart of it. In order to have the very best you should go with the best mechanisms, so take the time to do a little research on this. 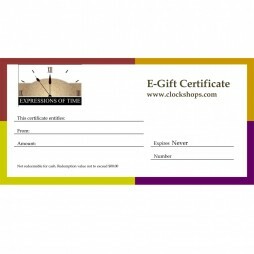 At Expressions of Time we encourage our shoppers to ask questions so they know exactly what they are buying! Many, if not all of our Black Forest cuckoo clocks come with a certificate of authenticity that includes movement mechanisms too. 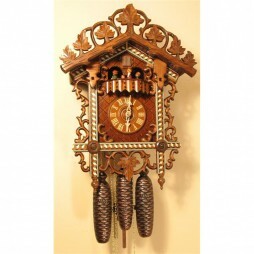 Your cuckoo clock is guaranteed to be the best quality, and we stand by that as well. Shoppers just need to be aware of the differences in clocks. For instance, the quartz style versus the mantle style are very different and have distinct characteristics. 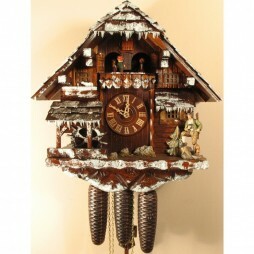 Expressions of Time offers such a large variety of Black Forest German cuckoo clocks, both musical and silent. We’ve said before that there is simply no way any collector will be disappointed in the selection! Whether you might choose traditional oak or even white oak—you’ll find all of these to be sublime and full of animation too!